We’re coming back to Cape Breton! 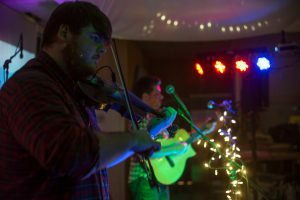 Click the link to find out more information about this brilliant festival, this year’s line-up, and you’ll also see our bouzouki poster boy Adam on the front page! Stupid Mec Lir Party Piece Mouth Wobble Competition 2015! Who fancies the chance to win a VERY limited edition Mec Lir T-Shirt (as modelled by Adam’s Dad here), signed poster and signed CD? All we need is for you to post a video of yourself doing the Mec Lir mouth wobble to our Facebook page, and the best entry, as chosen by the band themselves, will win! Simple as that. We’re extremely pleased to finally announce our first festival in Canada, and what a festival! We’ll be heading out to Celtic Colours in October. More information on our gigs and the festival in general is available on the Celtic Colours website. Check out the promo video for 2015 here, it looks like it’ll be a good one! Well, there goes 2014. What better way to finish off the year than by having a sell out gig at Noa Bakehouse?! 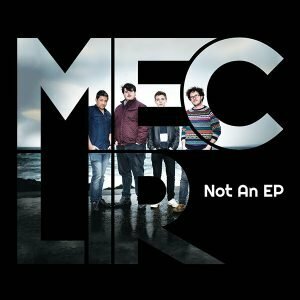 We’re finally officially launching our debut CD ‘Not An EP’ on the Isle of Man in a few weeks time. The launch will be held at Noa Bakehouse in Douglas on Sunday 21st September from 8pm. We’re very excited to be joined on the 21st by local legend Davy Knowles, who will be playing a few sets with us, and also very lucky to have Nick Barlow playing support. 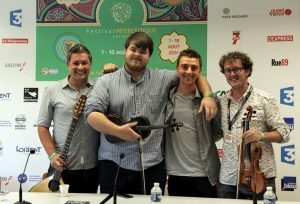 Merci Festival Interceltique de Lorient! (& merci Christy for the lovely pic) We had a blast / Nous avons eu un grand temps! After a fantastic week of playing at the Manx Pavilion to crowds of enthusiastic music lovers, what a great send off it was to perform at the Espace Bretagne alongside the brilliant Ny Fennee Dancers and blues legend Davy Knowles!